The Mediterranean diet garnered heaps of praise in 2019, thanks to its recent recognition as the healthiest eating plan in the world. The fact that it promotes longevity is backed by plenty of studies and it’s a relatively easy diet to follow. But a lesser-known eating plan may be coming for the Med diet’s crown. Meet the Okinawa diet. The Mediterranean diet, of course, emphasizes healthy fats like omega-3s, protein from primarily seafood and plant sources, and lots of fruits and vegetables. The Okinawa diet, on the other hand, is plant-driven, with most nutrients (including carbs) coming from vegetables and legumes locally available on the island. I asked Dr. Day and Minno, as well as Brigitte Zeitlin, MPH, RD, the owner of BZ Nutrition in New York City, to break down the differences between the two healthy eating plans. Don’t get it twisted: “It is not a vegetarian diet, just eats less [meat] than the Mediterranean diet,” says Zeitlin. In the Mediterranean diet, omega-3-rich protein sources like fish, shellfish, and other types of seafood reign supreme, followed by vegetables and legumes (with small, occasional amounts of red meat thrown in for good measure). The Okinawa diet, on the other hand, is extremely vegetable-forward, especially with protein. “Protein comes from small amounts of fish, occasional pork, and mostly from plant-based sources such as vegetables, legumes, and tubers,” says Dr. Day. Soy is also a big component of this eating plan, adds Zeitlin. 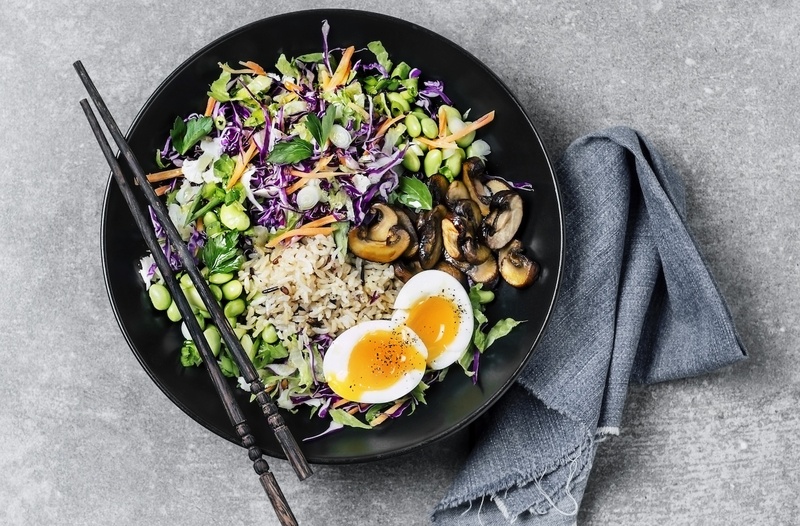 Specifically, the Okinawa diet involves a 10:1 ratio of carbs to protein (let THAT sink in), which researchers have consistently found is nearly identical to the optimum ratio of carbs and protein for longevity in rats and other animals. The Mediterranean diet also endorses healthy carbs from whole foods (although not as intense as that 10:1 ratio), and encourages whole grains as well as fruits, vegetables, and other plant-based carbohydrates. If you love rice and pasta…the Okinawa diet is not for you. “This diet is very low in refined carbohydrates like white rice, bread, pasta, sweets, and baked goods,” says Zeitlin. However, it packs in lots of complex carbohydrates (remember that whole 10:1 ratio?) in the form of potatoes, squash, soybeans, and lentils, she says. The Med diet does have those complex carbs, but still allows for some simple carbs like grains, breads, and pasta. “If people are mostly grain-free already, the Okinawa diet could be a better option for them to try,” Zeitlin says. However, the limited grains could be a tough shift for others, she says. “You will have to cut back on your oatmeal, quinoa, brown rice, and whole wheat bread,” she says, to one to two times per week. Compare that to the Mediterranean diet, which she says promotes one to two servings of grains per day. Unlike, say, paleo or Keto, no vegetable or fruit is off-limits on either the Mediterranean diet or the Okinawa diet. And their inclusion is central to both plans’ longevity-promising benefits. “The vitamins, minerals, and antioxidants in these varying fruits and veggies is what will promote a longer (and healthier) life,” Zeitlin says. Minno adds that the Okinawa diet focuses on veggies that are local and easily available to the population, like purple sweet potatoes, seaweed, Goya (bitter melon), and soy beans. “The diet is also known for being rich in yellow and orange vegetables with are common sources of carotenoids, nutrients that can help reduce inflammation, support eye health, and support a healthy immune system,” she says. But again, all veggies are on the table so to speak. Similarly, the Mediterranean diet does not emphasize tracking calories or macros. It’s widely considered by experts to be permissive, unlike other eating plans. Both the Mediterranean and Okinawa diets come from Blue Zone areas that promote longevity. “Because of their emphasis on that plant-based life, both diets are high in fiber and antioxidants that help to fight chronic illnesses life diabetes, inflammation, heart disease, and certain cancers, and promote healthy skin, hair, and nails,” says Zeitlin. However, Zeitlin adds that the Okinawa diet is lower in dairy, which may help promote clearer skin if you’re acne-prone. Zeitlin agrees. “The key take away from both lifestyles is that they want you eating fruits and veggies, and that is the foundation of any healthy lifestyle,” she says. So whether you’re more into the specifics of the Okinawa or the Mediterranean way, you’re still on the way to a potentially longer life (with lots of health benefits to boot). Additional reporting by Emily Laurence. Speaking of healthy eating plans, here’s why the keto diet was freaking everywhere last year. And if you want to try the Mediterranean diet for yourself, check out these cookbooks for inspiration.